Cathy Wong: "Rugby's values like respect transcend into everyday life"
On the eve of the Oceania Rugby Women's Championship 2018, we caught up with Oceania Rugby's Women's Director Cathy Wong to talk about how the region are using rugby's values to help more women play the game and to combat domestic violence. Oceania Rugby hopes its efforts to provide pathways that allow more women to engage with the sport in the Pacific can also help combat issues affecting the region, such as domestic violence. Samoa’s female players will make their return to test action on Friday as they kick-off the Oceania Rugby Women’s Championship 2018 against Papua New Guinea at Churchill Park in Lautoka, Fiji. Hosts Fiji will also play Tonga on the opening day of the round-robin 15s tournament, which follows less than a week after Australia won the Oceania Rugby Women’s Sevens Championship 75 miles or so south-east in Suva. That competition was played alongside the men’s tournament at ANZ Stadium, with Fiji ensuring a clean sweep for the gold medal-winning teams from the Rio 2016 Olympic Games. Cathy Wong, Oceania Rugby Women’s Director and World Rugby Council member, says that the impact Fiji’s successful campaign in Rio had on the Pacific provided a “light-bulb moment” about what could be achieved. Oceania Rugby has since teamed up with UN Women, and in August announced an initiative designed to promote gender equality that is also part-funded by the Australian Government and the European Union. “The whole reason we decided to partner with UN Women is because rugby’s values are respect and integrity. There is no respect in domestic violence,” Wong said. “When we teach someone to play rugby, we teach them respect and that transpires through to everyday life: they respect their brother, they respect their sister, they respect their auntie, they respect their grandma. “We are using rugby as a tool to really enhance raising awareness of domestic violence and to try and get numbers down. “In taking this forward, we would like to take it into primary schools so that kids are taught to respect everyone as a human being. According to Wong, the number of women engaged with rugby – whether that be as a player, coach or administrator – has “really escalated” since the Rio Games but there are still obstacles in their way. “The Pacific is still a very patriarchal society and that’s embedded in everything,” Wong said. “Women are expected to cook, clean, to do the homework with the kids and nowadays a lot of women are working over and above all that. Sport is done after work. 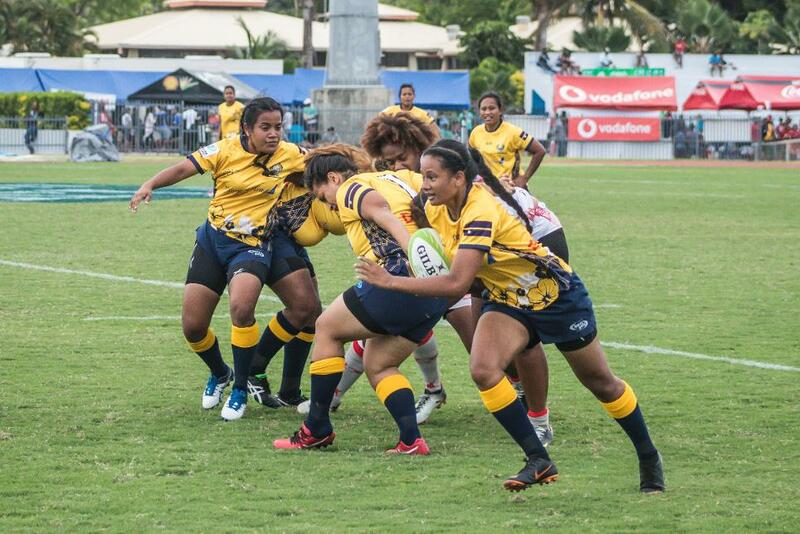 Attitudes in the Pacific are slowly changing, eight women’s teams competed in last weekend’s sevens tournament with the tiny island nation of Nauru and New Caledonia sending a team for the first time, with the former making their international debut (pictured above). Wong believes that is a “huge breakthrough” given Nauru is primarily a weightlifting country, having won 10 Commonwealth Games gold medals in the discipline. Naura’s women competed against Samoa, Papua New Guinea and eventual champions Australia in Pool A, with their schedule integrated with that of the men’s competition. "My biggest dream, my biggest vision if you like, is that when we talk rugby, we talk rugby, full stop – not men’s rugby and not women’s rugby." Wong paid tribute to the work being done by Oceania Rugby and its member unions to get to a point where women have gained recognition within the game, but her work is far from done. Her ultimate ambition is that in future people will not think about rugby in gendered terms – they will just think about rugby, as one game. “In Oceania Rugby what we have really put in force is that Oceania Rugby is Oceania Rugby, there is no men and there is no women, and we want the same atmosphere to be instilled in all our 13 member unions,” Wong said. “My biggest dream, my biggest vision if you like, is that when we talk rugby, we talk rugby, full stop – not men’s rugby and not women’s rugby. Wong is hopeful that it won’t take too long for that dream to become a reality.